The troops are on a train, advise, and assist mission, but the line between advising and combat is growing blurry. The Taliban offensive in Helmand Valley continues unabated. 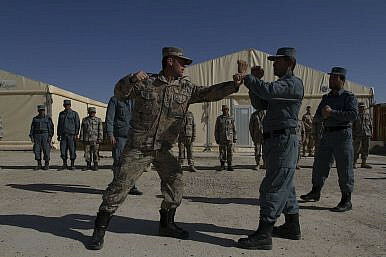 In an effort to protect the provincial capital from collapse, the U.S. Department of Defense announced that roughly 100 troops have arrived in the capital under the train, advise, and assist Resolute Support mission. Local residents have described the situation as tense and frightening. “We are tired of the situation; all four directions into Lashkar Gah are under siege,” said Sifatullah, a resident. “The situation is very bad, the areas surrounding Lashkar Gah city are controlled by the Taliban and even Lashkar Gah city is run by Taliban and the government,” said Sultan Mohammad a resident. Villages surrounding the city that were previously reported as clear are still contested, with ongoing fights in Nad Ali and Nawa. According to the Guardian, the government only retains control of a few administrative buildings in these districts. The strategic highway linking Lashkar Gah to Kandahar remains closed, with upwards of 20 checkpoints established by Taliban forces. As reported on Wednesday, an American service member was killed in Lashkar Gah when his patrol was struck by an improvised explosive device; six Afghan soldiers and another American soldier were wounded in the same incident. It is the second casualty this year for U.S. forces as a result of hostile fire from enemy forces. Afghan forces are currently engaged in high stakes battles throughout the country side with ongoing sieges of two major population centers in Kunduz and Lashkar Gah. General Charles Cleveland has attributed much of the woes of Afghan forces to leadership problems. The rise of the well-equipped Taliban force raises points to endemic corruption in Helmand.